Now in its third year, the show gives golfers from all across the north of England a chance to immerse themselves in golf for the whole day. There will be hundreds of brands on view and its your chance to meet the exhibitors and take part in the demonstrations. You can also take advantage of custom-fit advice and there will be opportunities from the leading manufacturers, expert coaches and even a dedicated ‘Golf Tourism Show’ to peruse. Many of the most prestigious brands from the world of golf will be showcasing their latest products at the show, with experts on hand offering custom-fitting for visitors, from everything from wedges to drivers all our bespoke indoor driving range. Where is the show taking place? Manchester Golf Show at Event City at The Trafford Golf Centre once again plays host to the event, and there will PGA qualified coaches on hand to meet all visitors looking for a quick fix on their golf swing plus free golf tuition for all. Yes, the Trafford Golf Centre team will be giving any lapsed golfers or those new to the sport a FREE golf lesson, plus a promotional voucher, allowing you to redeem 5 golf lessons for only £25 – part of an England Golf initiative to encourage greater take up of the game. What else will be going at the Manchester Golf Show at Event City? The Manchester Golf Show at Event City will also feature the Golf Tourism Show which introduces visitors to fabulous overseas golfing destinations, including presentations on the main stage from exhibitors. sit back and enjoy a drink whilst your learn in the venue cafe. There will also be golf trick shot shows, expert advice and competition to win prizes. To see all the latest gear on show from the games biggest names, get yourself a free golf lesson or even your first ever golf lesson and find great new places to play golf here in the UK and overseas, book your tickets to the Manchester Golf Show at Event City or call 0844 858 6749. Pro Tips – Practice at the golf range …. What happens when you go to practice at the golf range? I’m guessing it’s a large bucket of balls and repeatedly hitting 7 iron and driver? Am I right? While this can be good when you have just had a lesson or have something technical to work on, but simply hitting balls won’t improve your golf. I will briefly run through how to practice after a lesson and then go on to how to not only make your practice more enjoyable but also more effective for your golf. Yes, you do need to hit 7 iron, driver or whatever club your pro has told you to use, do the drills, and engrain the movement. This is what we call block practice – hitting the same shot, same swing, over and over. It’s really good for getting the swing engrained and making a change but as soon as you are faced with a variable – an awkward lie, a longer club, a different wind direction etc., it can be counter-productive to keep making the same swing. When we play golf – we don’t hit the same shot twice…so why practice the same shot twice? I like to have my pupils spend 50% of their practice session doing block practice after a lesson, to get a feel for the movement and make the change. The other 50% of the practice session, I like them to do variable practice. If you don’t have lessons but love to get down the range between games – spend all your practice time doing this. Especially if you are playing well! Variable practice is hitting different shots, creating different scenarios for each shot, playing games! This practice relates much more to playing golf and can create pressure like you will get on the golf course. Drill 1 – Pick a target and a club – depending on your level, aim to hit, for example, 4/10 balls within 40ft of the target. Once you hit the goal, increase the number out of 10 or decrease the target size (i.e. 40ft down to 30ft). This will help you improve your focus and get you zoned in. Drill 2 – Get 3 balls, aim straight and try to start one ball left, the next one right, and the third – straight! This will start to give you good clubhead control. Drill 3 – Short game – play “Par 18”. Hit 9 completely different chip shots i.e. 3 chip and runs, 3 difficult chips to a tight pin, 3 average chips. Do one shot at a time and don’t repeat the same shot twice. The idea is to chip the ball to the hole and putt out. Record your score. The idea of Par 18 is each “hole” is a par 2 so you want to get up and down. Record your score and keep trying to improve on your score – a great one to do with a friend (loser buys the beers?). Drill 4 – This next drill is great for better players but also good for higher handicap players to learn how to get out of trouble. 4 balls – 1st ball draw, 2nd ball fade, 3rd ball high, 4th ball low. Good for lower handicap players to shape the ball into pins. For higher handicaps you will learn how to hit different shots and maybe instead of chipping out the trees – you can produce your own Seve magic! Recognised as the only global amateur series for boys and girls, the Faldo Series was established in 1996, expanding to Asia in 2006. And now entries for the 2015 Faldo Series UK Championships have now opened…. Today, 40 Faldo Series tournaments take place in 30-plus countries worldwide, touching more than 7,000 golfers each year. Past winners include Tseng Ya-ni and Rory McIlroy, who took his tally of professional Major titles to four with his Open Championship and US PGA Championship victories in 2014 and gave a significant contribution to Europe’s Ryder Cup vistory! Six-time Major winner Sir Nick Faldo launched the Faldo Series in 1996. Now in its nineteenth season, 40 tournaments take place in 30 countries worldwide and thousands of talented young golfers take part each year. Past winners include Major Champions Rory McIlroy and Ya-Ni Tseng. Continuing last season’s success, the competition has maintained the 54-hole format at each tournament counting towards the World Amateur Golf Ranking. However, new to this year’s event will be entries for our friends in Ireland Championship will also be taken online via our UK Entries page. Andy Clissold – TSG Head Pro (Photo: Cranham GC, Essex). Andy Clissold announced as first TSG Head Pro …. Andy’s new role will be to provide coaching and tuition to all the TSG members and will include running online Q&A tuition sessions and webinars. He will be organising on-course ‘coaching events’ whereby TSGers, of all playing standards, will be given the chance to play with him for three or four holes in a round, for no more than your green fee. He will also be offering his own golf lessons and golf coaching packages to the membership. As TSG Head Pro he will also be working closely with the TSG team to develop the overall usability of The Social Golfer Network; which caters to 4k+ UK golfers and 8.5k+ registered users worldwide. Furthermore, Andy will be the main contributor of monthly Newsletter PRO Tips and will be a core part of the TSG official events team, which currently runs The TSG Masters, TSG OPEN and TSG Matchplay Championships. Essex based Andy began his golf career as a Pro Shop Assistant at Blakes Golf Club in Epping in 2006. He subsequently worked as Assistant Professional at Bentley Golf Club as he went on to complete his foundation degree in golf at Birmingham University. He has since worked as a teaching Pro at City Point Golf Studio, London. He currently coaches at Ingrebourne Links and Crowlands Heath GC. Commenting on his new role, Andy said “I have been aware of The Social Golfer platform for some time but it was only when I sat down with the team that I truly understood the potential of the site. Social media has made a huge impact on the way we all interact with each other and sport and I am honoured to be given this opportunity to be the first TSG Head Pro and help shape the future of golf in the UK and beyond – I can’t wait to get started”. Ian Mullins, owner of TheSocialGolfer.com said “We have worked with a number of PGA Pro’s since our launch but Andy immediately understood what we are trying to achieve at TSG and has already contributed greatly to the ideas pool. With 66% of golfers in the UK NOT belonging to a golf club, Andy’s contributions will allow us to provide our members with added value to their annual membership fee. We are really looking forward to Andy be a valuable asset to the team”. The announcement comes on the back of TheSocialGolfer.com recently reaching its first 1m hits in a single calendar year and breaking through the 100k page hits in a single month. With over 900 events posted and 4500+ rounds played on the site last year alone, 2015 is looking like it will be another great year for the website! Looking for a Valentine’s Day Gift for Golfers? Why not surprise your loved one this Valentine’s Day with a gift that last all year? Let them join golf games in their area, track their scores and watch tuition videos + compete in site competitions. We believe that golfers should be able to play anywhere, at anytime, whether they belong to a golf club or not. 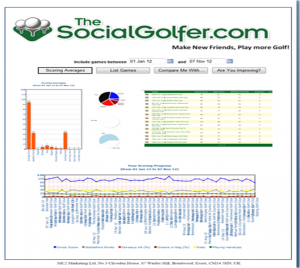 By joining thesocialgolfer.com community, you can arrange games close to home or with 8,500+ golfers worldwide…..
– Receive The TSG monthly Newsletter with tips and advice from qualified PGA golf Pros! PLEASE NOTE: Once you have completed your purchase, your voucher will be emailed to you within 24 hours. If for any reason you have not received your voucher within that period, please check your spam file for our email…. if you are still not receiving your voucher, please email us at theteam@thesocialgolfer.com, and one of our team will respond to the problem straight away. We have worked hard to establish a tried and tested formula on the site, in order that golfers of any standard can calculate their golf handicap with very little effort…. The TSG Handicap Tracker allows you to enter in your scorecard after every round (hole by hole). After taking into account the course layout, the course SSS (Standard Scratch Score) and your existing Golf Handicap – this starts at 28 for men and 36 for women. It will then deduce what your new handicap is, after every round. The TSG Handicap Certificate can be found (and printed) under the My Handicap Menu tab on the main Members page. 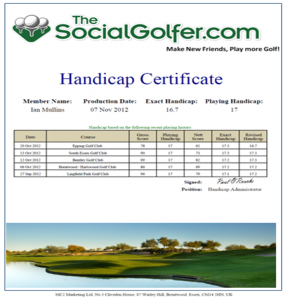 Is the TSG Handicap Certificate accepted at golf clubs? This certificate is widely accepted by golf clubs and golf courses all over the world and at the time of going to press, we have never heard of anyone having been refused entry with it. Of course, our certificate is not authenticated by CONGU. This is because The Social Golfer does not own a golf course, but otherwise the certificate is calculated using the same calculation. The TSG Handicap Tracker can not only produce you a Golf Handicap Certificate once you have entered in your scores, the TSG system will also allow you to track you scores over time AND allow you to compare your stats with your friends and your fellow TSGers. Keep a track of your Putts, Bunkers, Lost balls and much more. All of your stats are recordable and with gentle analysis, this will help to understand which parts of your game need improvement and which area of your game is taking shape. Many TSGers now use this system to keep their entire golfing history all in one place. We have continued to update the system with new improvements and sections and will continue to respond to all requests from our members on how to improve it. However, if you’re looking for an affordable and accurate way of tracking you golf handicap, look no further than TSG. Well, that’s open to debate! We believe adamantly that a TSG Golf Handicap Certificate is actually MORE accurate and reflective of your playing standard than a standard CONGU club handicap. Why? Well the TSG system lets you enter in a score EVERY time you play. In addition, whilst many of our members are club members, almost all will tell you that their TSG Handicap is lower than the one provided by their club and therefore more ‘in tune’ with their playing ability. Of course, the TSG certificate is not accepted in club competitions but it is accepted at ALL TSG events and even some well known amateur tours. The TSG Golf Handicap Certificate and Handicap Tracking is included in the TSG annual PRO membership subscription fee of £24.99.